The 1924 Summer Olympics, officially known as the Games of the VIII Olympiad, were an international multi-sport event which was celebrated in 1924 in Paris, France. The women's 100 metre freestyle was a swimming event held as part of the swimming at the 1924 Summer Olympics programme. It was the third appearance of the event, which was established in 1912. The competition was held on Saturday July 19, 1924, and on Sunday July 20, 1924. The women's 4×100 metre freestyle relay was a swimming event held as part of the swimming at the 1924 Summer Olympics programme. It was the third appearance of the event, which had been established in 1912. The competition was held on Friday 18 July 1924. 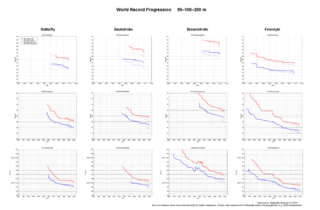 This article includes the world record progression for the 4×100 metres freestyle relay, and it shows the chronological history of world record times in that competitive swimming event. The 4×100 metres freestyle relay is a relay event in which each of four swimmers on a team swims a 100-metre freestyle leg in sequence. The world records are recognized by and maintained by FINA, the international competitive swimming and aquatics federation that overseas the sport in international competition. Helene Emma Madison was an American competition swimmer, Olympic champion, and former world record-holder. Sylvia Eliina Ruuska is an American former competition swimmer, Olympic medalist, and former world record-holder in two events. Ethelda Marguerite Bleibtrey, also known by her married name Ethelda Schlatke, was an American competition swimmer, three-time Olympic gold medalist, and former world record-holder in multiple events. Susan Christina von Saltza, also known by her married name Christina Olmstead, is an American former competition swimmer, Olympic champion, and former world record-holder in four events. Irene May Guest, also known by her married name Irene Loog, was an American competition swimmer, Olympic champion, and world record-holder. She represented the United States as a 19-year-old at the 1920 Summer Olympics in Antwerp, Belgium, where she received a pair of medals. Guest received her first medal in the women's 100-meter freestyle in which she finished second behind fellow American Ethelda Bleibtrey, earning a silver medal with a time of 1:17.0. In the women's 4×100 metres freestyle relay, she won a gold medal with U.S. teammates Bleibtrey, Frances Schroth and Margaret Woodbridge in a new world record time of 5:11.6. Jan Margo Henne, also known by her married name Jan Hawkins, is an American former competition swimmer, Olympic champion, and former world record-holder. Mariechen M. Wehselau, also known by her married name Mariechen Jackson, was an American competition swimmer, Olympic champion, and world record-holder. Martha Maria Norelius was a Swedish-born American competition swimmer, Olympic gold medalist, and former world record-holder in five different freestyle swimming events. Euphrasia Louise "Fraze" Donnelly was an American competition swimmer, Olympic champion, and former world record-holder. Donnelly represented the United States at the 1924 Summer Olympics in Paris, where she won a gold medal as a member of the winning U.S. team in the women's 4×100-meter freestyle relay event. Donnelly and her American relay teammates Gertrude Ederle, Ethel Lackie and Mariechen Wehselau set a new world record in the event final of 4:48.8. Albina Lucy Charlotte Osipowich, later known by her married name Albina Van Aken, was an American competition swimmer who won gold medals in the women's 100-meter freestyle and 4×100-meter freestyle relay at the 1928 Summer Olympics in Amsterdam, setting world records in both events. Carolyn Jane Schuler is an American former competition swimmer, two-time Olympic champion, and former world record-holder. Linda Lee Gustavson, also known by her married name Linda McGuire, is an American former competition swimmer, three-time Olympic medalist, and former world record-holder in two events. As an 18-year-old, she represented the United States at the 1968 Summer Olympics in Mexico City, where she competed in three events and won three medals. 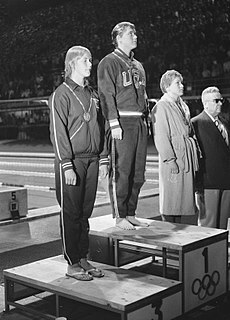 Susan "Sue" Jane Pedersen, also known by her married name Susan Pankey, is an American former competition swimmer, four-time Olympic medalist, and former world record-holder in two events. Cynthia Lee Woodhead, commonly known by her family nickname "Sippy", is an American former competition swimmer, world champion, Olympic medalist, and former world record-holder. She won three gold medals at the 1978 World Championships, when she was only 14 years old, and set seven world records during her career. 1 2 3 4 5 Sports-Reference.com, Olympic Sports, Athletes, Ethel Lackie. Retrieved November 22, 2012. ↑ Sports-Reference.com, Olympic Sports, Swimming at the 1924 Paris Summer Games, Women's 100 metres Freestyle Final. Retrieved November 22, 2012. ↑ Sports-Reference.com, Olympic Sports, United States Swimming at the 1924 Paris Summer Games. Retrieved November 22, 2012.